Knowledge of God is knowledge of self; knowledge of self is knowledge of God (Calvin); oh to know both in order to be healed and a healer…Isn't it all about relationship in the end? 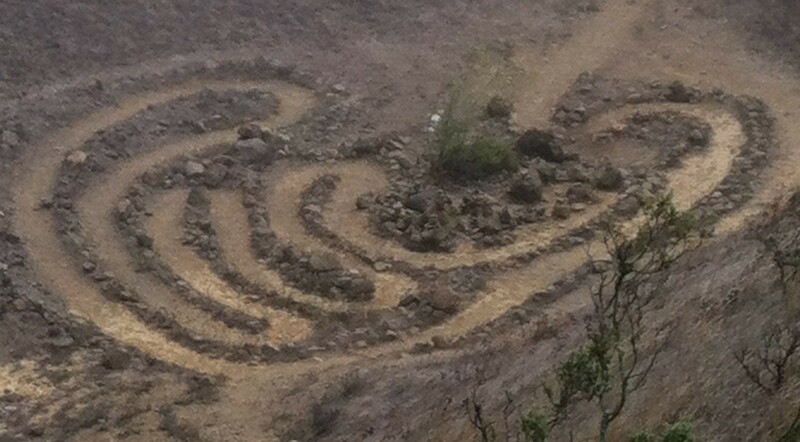 Labyrinths are invitational – enter in with your burdens, give them to Love, walk out with new purpose. Loving self and loving God(dess) might, in the end, be about listening, loving, letting go. Yesterday I had the privilege of meeting Pastor Lee. He spoke in broken English and some Korean. I was accompanied by the Student Pastor of the church I serve who is also Korean and he helped translate when Pastor Lee switched from English to Korean. We met with Pastor Lee because he has a weekly church service with people who are experiencing homelessness in Uptown, a neighborhood near mine in Chicago. Every week he has between 50 and 100 people coming for church. In his broken English, he leads worship and preaches very long sermons. When I first heard about him, I had so many questions I just had to meet with him. We met at McDonald’s and as he patiently responded to my questions, he told me part of his story. What an amazing story! Pastor Lee is ordained in the Methodist Church of Korea. He served as a Chaplain in the Korean army for more than 10 years and served as a Parish Pastor for the rest of his professional life. His wife decided more than 20 years ago to move to Chicago to be with her mother and sister. Pastor Lee did not want to move so he stayed in Korea. More than 10 years ago, his wife (through some tricks, according to Pastor Lee!) managed to get him to move to Chicago. When he arrived in Chicago he was angry with his wife for tricking him and he prayed to God for purpose. Pastor Lee says that God told him to go and be a minister to people experiencing homelessness. His wife was not comfortable with him doing that so he decided to follow God instead of listening to his wife. Pastor Lee left the high-rise he was living in with his wife and moved into a homeless shelter for men in Uptown. He lived in the shelter for one year. He talked about how scared he was initially because many of the men in the shelter had spent time in jail. He described some of the men and their tattoos and he said he prayed to God for help and God told him to love the men around him. So he did. Pastor Lee said he became friends with many of the men. Eventually he was able to qualify for a senior living apartment and he moved out and then began inviting all of his friends to a Korean church several miles away. Each Sunday he would drive the church van, pick them all up and take them to church and then return them to Uptown afterward. He realized it was too much and the van wasn’t reliable enough so he asked some churches for space and was denied. The Inspiration Cafe decided to let him use their space on Sunday mornings for 2 hours. He leads the church service and loves the people. After church he gives those who come either food or food cards so they can eat. Pastor Lee lives on his retirement income from Korea and he lives very simply so he can afford to give food every Sunday. When I asked him what he does all during the week he said he prays. Sometimes he prays 7, 8 or 10 hours each day. Pastor Lee told me you cannot do anything without prayer. Indeed. Pastor Lee said he prays so he can follow Jesus as far as Jesus wants him to. Last Sunday he had 100 people in church! He said that God promised all along if Pastor Lee would follow Jesus, God would bring the people. In my lifetime I have heard many people’s stories. Even though I may have different ideas of God or different ways of hearing God or different ways of talking about God, I have always been inspired by people who are really willing to give up everything to follow. This entry was posted in Uncategorized on September 27, 2016 by revbethb.